How to Format C Drive in Windows 10/8/7? Position: How Tos - Partition Management - How to Format C Drive in Windows 10/8/7? Do you know how to format C drive or the partition where Windows or other operating systems is installed? 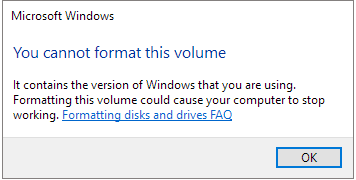 Windows does not allow users to format C drive when system is running, for formatting C drive removes operating system, installed applications and other data on the partition. In this case, we need to complete the task outside of Windows. In this guide, you can find several ways to format C drive (system partition) in Windows 10/8/7. 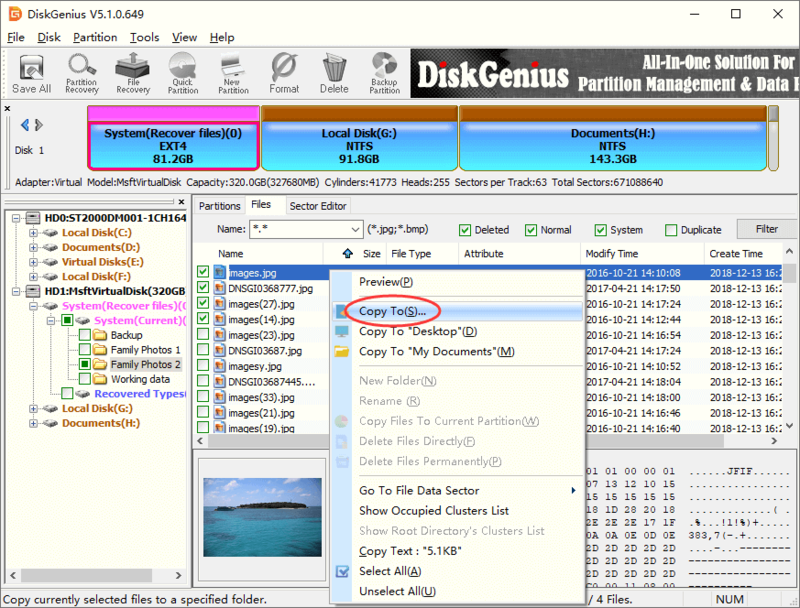 DiskGenius - Free disk partition manager to format hard drive, wipe disk, extend C drive, access ext4, etc. Formatting refers to the process of preparing a new partition or remove existing data on a hard drive or USB storage device. The formatting process can be applied to various storage media such as hard drive, memory sticks, virtual disk, SSD, USB flash drive, external HDD, etc. If the drive contains important data and it is the only copy of your data, you'll face data loss issue once formatting performed to the disk. Quick format: Windows performs quick format by default. As the name suggest the formatting process is very quick. By way of quick formatting, you can change file system type as well as remove data off the entire partition. But the quick formatting does not erase data permanently, and you can run data recovery as long as lost data is not overwritten. Full format: A full format runs an additional step than quick format. When you run a full format on partition or volume, data will be completely wiped from the partition being formatted and partition is scanned bad sectors. The formatting is very slow and majority of time taken by the process is used to check bad sectors. Retire computer: When you want to replace your computer with a new one, you might need to format computer to erase data before selling or giving away in the view of data security. Upgrade system disk: Windows is installed on an SSD which is running out of free space and you plan to upgrade the disk to a larger one. Erase data: It is advised to wipe hard drive before recycling or donating it, as the drive might contain sensitive data. Remove virus and malware: Operating system infects virus or malware is dangerous to personal data, as files might be damaged, lost or even leaked to third-party. Formatting C drive can wipe virus or malware safely and safeguard computer. System has crashed: Operating system on your computer cannot boot, and formatting C drive and reinstalling system might be ultimate solution. Reinstall OS: You need to format system partition before reinstalling it or changing Windows version. In this case, you can format C partition with the system setup installer during reinstalling. Windows sets this limitation out of security consideration so that users cannot delete system by mistake. System volume stores booting files like boot.ini, bootmgr, bcd, etc. that are necessary for system booting. Besides, C drive is set as active partition and there is only one active partition on a single disk. This partition cannot be formatted or deleted within Windows. Though it is not allowed to format C drive in Windows like you format other drives, you can format C drive outside of Windows. Sounds complicated? Actually, it is quite easy to do the task. The following part will discuss several methods to format system partition on Windows 10/8/7. Since formatting removes all data on the partition, you should create backup for important files. After formatting C drive, computer won't be able to boot, and you need to considering reinstalling operating system. Step 1 Insert Windows setup disk and restart computer. 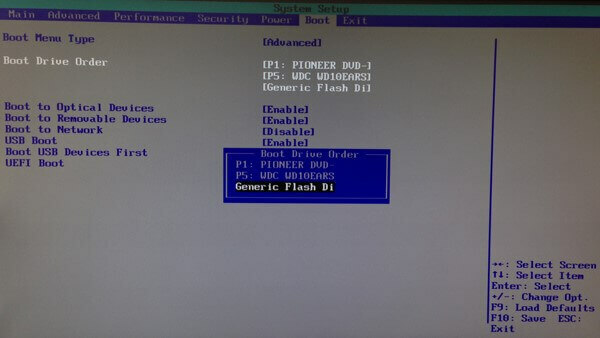 Then enter BIOS to change boot sequence to let computer boot from the disc. Once your computer boot from the disc, you can see the installation interface where you should select language first. Step 2 When you get to the page that asks "Where do you want to install Windows? ", you can choose system C drive and press Format option. Once C drive gets formatted, you can either continue to reinstall Windows or exit. Note: If you do not have a system repair disc, you can follow steps in method 3 to complete formatting task. Step 1 Boot to system repair disc. After changing boot sequence in bios and restart computer, after which computer will boot from the system repair disc. Step 2 Click Command Prompt from System Recovery Options. Then type command format c: /fs:ntfs and press Enter key. Note: the system is usually assigned drive letter C, but sometimes it might not be identified as drive C in command prompt of some system repair disc. So please make sure you are formatting the correct drive. 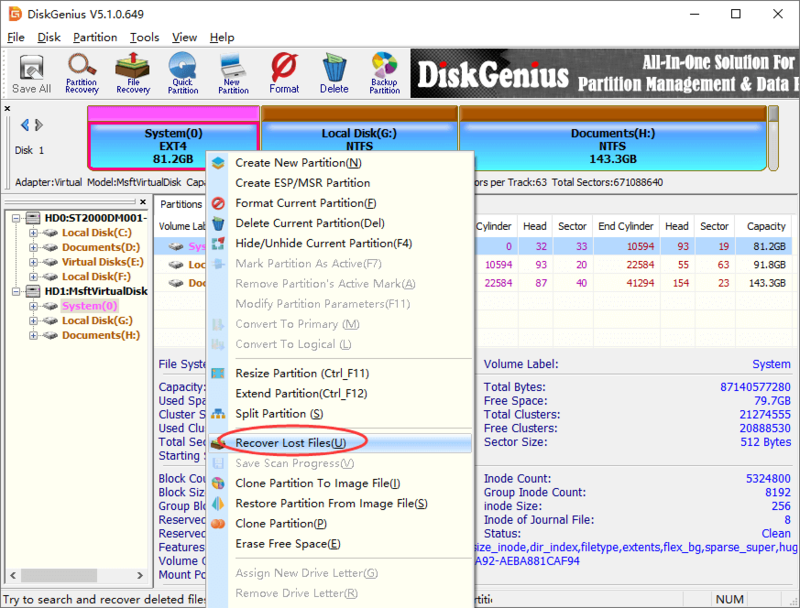 DiskGenius Free is disk partition freeware and it is able to make disk partition, recover lost data, back up data, etc. for instance, with this tool you can increase C drive space, format Ext4 partition, partition hard drive, recover RAW drive, recover deleted files, backup system drive, convert GPT/MBR, convert VMDK to VHD, etc. This section shows how to format C drive via DiskGenius WinPE Edition. Step 1 Create bootable disk for DiskGenius WinPE edition. Step 2 Restart the computer for which you want to format C drive and enter BIOS to change boot order, so that this computer will boot from the USB device. If you do not know how to enter BIOS or change boot sequence, you can seek help from the motherboard tech support. Save changes and restart computer. Then your computer boots from the bootable disk and DiskGenius will be launched automatically. Step 3 In the DiskGenius WinPE version, select C drive (system partition) to be formatted and click Format button from toolbar. Set file system type, cluster size, volume label, etc. and click Format button. Then DiskGenius will formats the partition quickly. Recovering lost files from formatted partition is an easy task as long as you use effective hard drive partition recovery software. 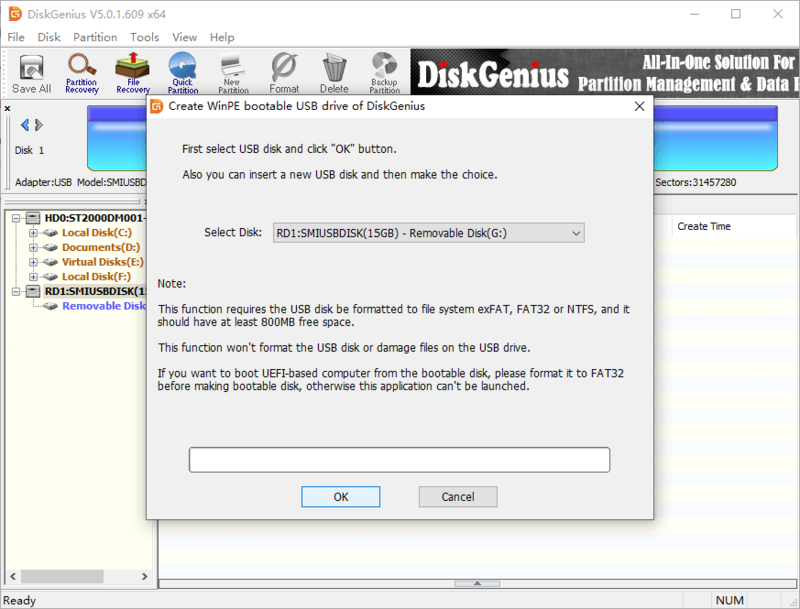 DiskGenius is capable of recovering data from formatted volume or USB drives. The optimized scanning mechanism is designed to quickly and accurately search for lost files sector by sector. Apart from recovering formatted partition, it is also able to recover files from RAW and inaccessible volume as well as deleted partitions. Different file systems are supported including NTFS, FAT16, FAT32, exFAT, Ext2, Ext3 and Ext4. The unregistered edition can scan formatted drive and preview lost data, so that you can make sure whether files can be recovered correctly prior to purchasing the licensed edition. If you want to recover formatted C drive, you may need to perform the recovery process outside of Windows. On one hand, once system partition gets formatted, computer won't boot to Windows anymore. On the other hand, even if system works well, it is not secure to recover lost data from system drive when Windows is running. That's because Windows may generate writing action at any time, and damage lost data. 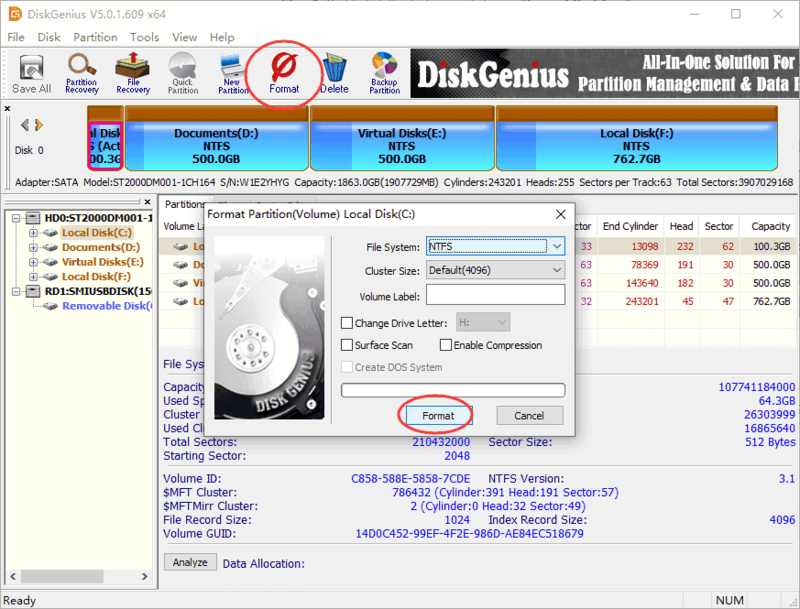 DiskGenius supports creating WinPE based bootable disk, and you can perform C drive data recovery with DiskGenius WinPE edition. Step 2 Select Complete Recovery and click Start button to search for lost data from selected drive. If you remember the file system type of the partition before it got formatted, then click Advanced Options button to select file system. "Search For Known File Types" option should be selected if lost files are partly overwritten. File preview can be done during or after scanning. Double-click a file and you can open it in preview window. The following screenshot shows the previewing of a JPG file. By way of previewing files, you can find out what you need to recover and whether they can be recovered correctly. Step 4 Copy and save files you want to recover. Select desired files and folders and right-click on them to choose Copy To. We've talked about several ways to format C drive for Windows 7/8/10 PCs, through which you can format system partition even though you do not have a system installation disc. Besides, we also introduce how to do formatted partition recovery, which helps to retrieve lost data from formatted drives. 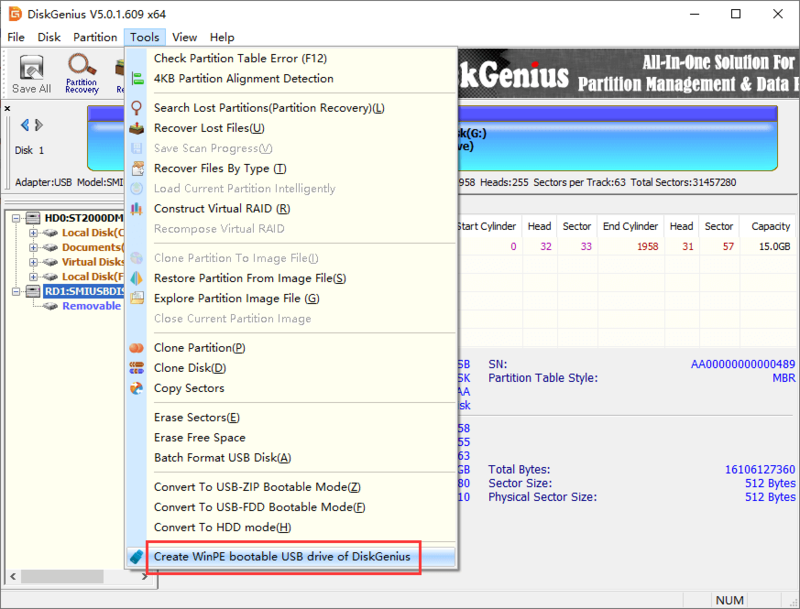 DiskGenius is a versatile tool that can help you format partition, wipe hard drive, resize partition, recover lost data, etc. Should you have any question or need any help regarding formatting C drive or using the program, please feel free to contact our technical support team. 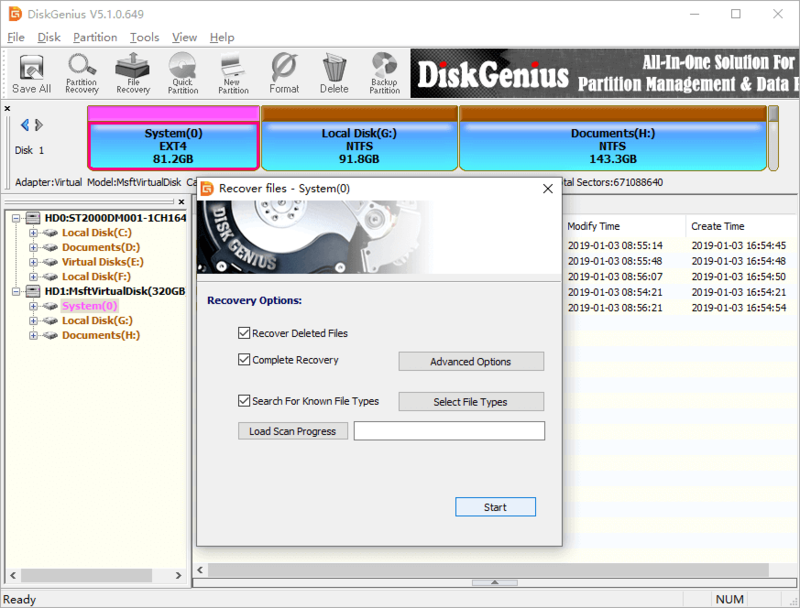 DiskGenius - Full-fledged tool to manage partition, recover lost data, image disk & partition, wipe disk, etc.